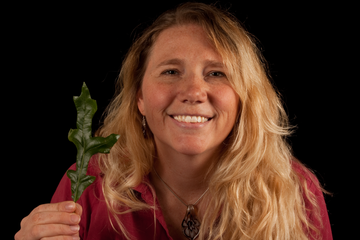 Bejat McCracken is the Executive Director and Photographer for Finding Species. She leads teams of scientists and photographers on projects where she has developed relationships, sought funding and created the plan. She photographs species throughout the United States, processes photographs and devises new plans for efficiency. She has accompanied and led numerous scientific expeditions to the Ecuadorian Amazon to photo-document amphibians, reptiles, insects and orchids since 1997, spending 5 years dedicated to her work in the field. Her collection of photographs contains around 60,000 photographs with many new species and undescribed species. Working with scientists particularly in Yasuni National Park, Ecuador, she has provided compelling photographs to assist in protecting this fragile ecosystem. She serves as the artist, photographer, field assistant and treasurer of the Tadpole Organization (www.tadpoleorg.org). Her work can be seen in various publications like Science Magazine, PlosOne, Phyllomedusa and American Museum Novitates, to name just a few. She has received many awards for her photographs from such organizations as National Wildlife Federation, NAAEE and Albert I. Pierce Foundation and various other organizations, where she is featured on their websites, publications, books, calendars and pamphlets. A graduate of the University of Texas in Austin, TX, she received her BFA in painting in 1997 upon which she received many fellowships and grants to travel to the Amazon and throughout South America. Her work as an artist (www.bejat.com) has ranged from paintings to murals and sculptures regarding the environment to evoke awareness and compassion, working with children individually and in local schools to educate them through art in various ways like murals, presentations and private art lessons. She exhibits throughout the United States in personal collections, galleries and alternative spaces and curated her own gallery in Austin from 2002-2008 called B Studio. Gorky F. Villa Muñoz is a Staff Botanist at Finding Species. He is the lead botanist for Finding Species on the LeafSnap project, through the Native Plant Program. He locates, identifies, collects and photographs plants throughout the United States. Mr. Villa brings to Finding Species over fifteen years of field experience in identifying tropical and temperate plants. He has worked on forest- and herbarium-based projects for The Catholic University of Ecuador, The Field Museum (Chicago), and for the Center for Tropical Forest Science of the Smithsonian Institution. Mr. Villa helped establish and has supervised the field staff in two Smithsonian Institution long-term tropical forest research plots—in Yasuni National Park and the Gamba Complex. He helped build and manage the databases for these plots, with information on the identification and location of thousands of individual trees. In the Yasuní plot, he and field team members identified over 152,000 trees representing over 1,100 species in a 25-hectare area, in a forest so dense, so poorly known, and of such high species diversity that the identifications required eight years of field and herbarium study to complete. Mr. Villa also held a Darwin Fellowship at the Department of Botany of the Natural History Museum (London), to document the ecological (non-pharmaceutical) knowledge and cultural and musical lore of the Huaorani people regarding their relationship with trees. He has also produced over 5,000 photographs of tropical trees. Mr. Villa received a combined B.A. and M.SC. Degree in Biological Sciences from Lviv State University of Ivan Franko, Ukraine. He has working fluency in English and Russian in addition to his native Spanish.